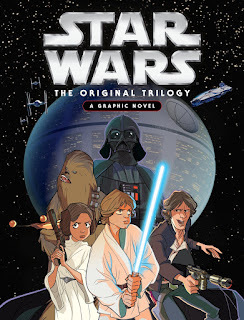 Star Wars: A New Hope, The Empire Strikes Back and Return of the Jedi, all in one enormous graphic novel! This is a must have for Star Wars fans with the stories from all three movies told in comic book style. There are just over 200 pages, all in full colour, and you’ll find all the characters you know including Luke Skywalker, Han Solo, Chewie, Princess Leia, and of course, Darth Vader and a host of others. For anyone who knows the original movie trilogy well, you will even be able recognise their faces as a version of the actors who portrayed them. The artwork is sharp and reminiscent of the seventies, and a lot of care has been taken to tell the story as it is known and loved, but also make it a new experience, just as good on the pages of a book as it is on screen. You’ll be able to travel to a galaxy far, far away, without turning on a television. Immerse yourself, and move from one story to the next and on to the final one without having to stop (unless you’re hungry or tired or something). Star Wars: The Original Trilogy: A Graphic Novel is an excellent addition to the home libraries of lovers of science fiction or fans of the blockbuster movie franchise.